I started french lessons this month and was *shocked* to discover how freaking hard it is to juggle intensive instruction, a full time job, and my 8 trillion personal endeavors. There’s nothing like putting in a full day’s work and then going home to study. Yes, this entry is almost entirely me complaining, and it has been tagged as such. 4th of July = Français! It’s a day off from work and I am on the couch about to start… my homework? …Am I nerd? Yes. 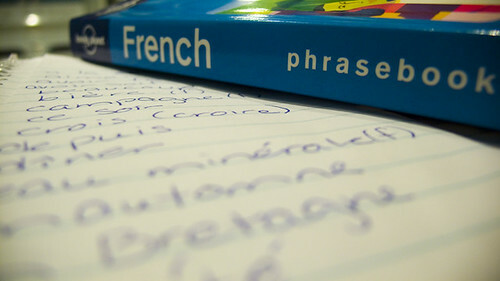 A nerd obsessed with becoming fluent in French. I will leave the house eventually because I have to see Transformers, but no movies for me until I finish my assignments (sigh). I have become so responsible lately, it’s quite frightening. Inspired by my first trip to Paris, this summer I decided to take a French 101 Intensive course. My instructor is Celine Brossillon through L’Atelier Français. She is a native speaker who has been teaching French in the United States since 2001. I chose a private instructor because my work/life schedule doesn’t allow me to attend classes, plus I like to work at my own pace (fast). I had my first lesson of the semester with her this past Monday, and although I was fearful that it would all be very overwhelming, she was really supportive and has made the process of managing my coursework, exercises, and study time seem achievable. We will be covering a lot of material. My goal is to be as fluent (writing and speaking) as I possibly can be by the end of the summer, and then continue my studies on a not-so-quite intensive scale through the end of the year. By the end of 2008 I want to speak and write in French on such an advanced level that I will be able to seriously consider moving there for a temporary time to do the same work I do here – only in France. Yay! After the jump are links and information on the 6 French podcasts I will be using to supplement my intensive course. Exclaimer: There are not Celine approved. She doesn’t know I found them yet, and they were not part of her syllabus. She did encourage me to find other ways to enjoy French language and culture so this resulted in a podcast search.